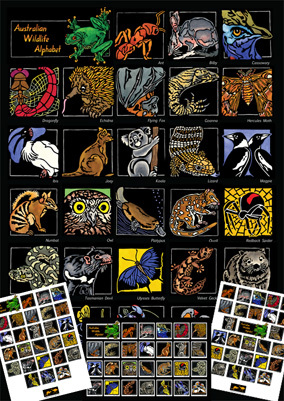 Over 10 years ago I worked on an Australia Fauna Alphabet but over the years my artwork, style & designs have developed & so a few years ago I decided to revisit the idea of producing a new Australian Wildlife Alphabet. 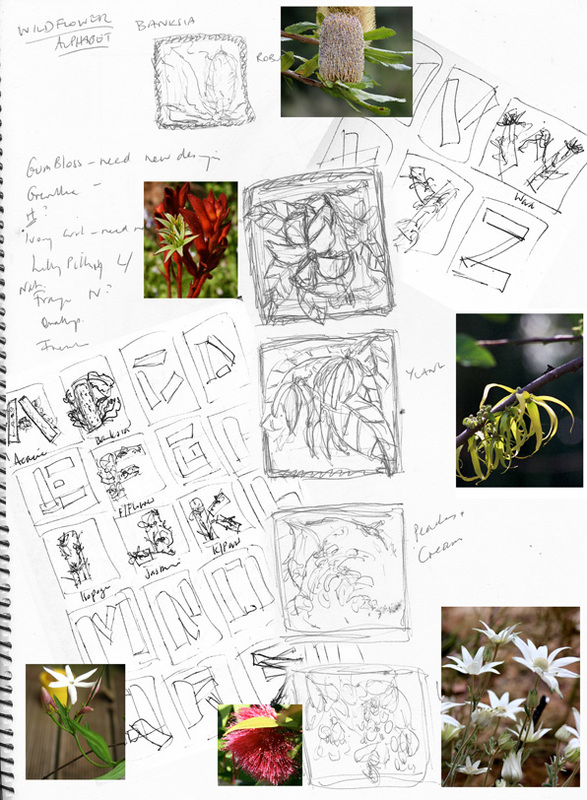 Alongside this I wanted to also develop an Australian Wildflower Alphabet. When I produced the original alphabet & exhibited it I had a lot of feedback about how it would be great for posters or friezes. My artwork has always had a focus on Australian wildflowers & wildlife – growing up in Sydney surrounded by the bush was a defining aspect of my life & it is my love of the bushland – both its flora & fauna – that has underpinned my artwork. I have always been drawn to exploring representations of wildflowers & wildlife whether that be drawings, illustration, photography or relief printing all my life. I love to draw others into this world through my artwork to explore the colour & vibrancy of the natural world that surrounds us in Australia. So about 5 years ago I started to develop these projects, starting in my usual way of working – the idea/concept with small thumbnail sketches of ideas. I am constantly taking photos & although I have always loved photography – recording events, including family – but I also underpin all my artwork with my photography. I like to look at everything that I draw & to take photos that capture all different aspects including not only the ‘structures’ of the objects/wildflower etc, but also light, colour & design possibilities. I have thousands of photos both digital & printed – and filed! This image incorporates kind of how I think in this phase of working from the idea into more concrete images. Photos, sketches, notes contribute to working through all my different ideas. I have lots of these small sketchbooks – I usually carry one with me so if I get an idea for something I can quickly note it down. I began my first designs with the wildlife alphabet & explored ways to represent both the particular species & the alphabet. I finally settled on the underlying idea of rather than using the actual letter, I would take the basic shape of the letter & explore how I could represent the particular species around this construct. I also made the decision to create 26 individual 10cm x 10cm printed images with both a header & a footer. The next step was to look at each ‘letter’ & particular species that could be used. Sometimes I would work on a couple of different drawings for a letter & some like these caterpillars never made it to the final artwork but who knows where or if they will be revisited for something later. I really enjoy this phase of experimenting with ideas & concepts & just the process of drawing is always lovely. In choosing which images I would use I needed to look at not only the individual designs but also the whole end product – trying to get a cross-section of birds, insects, mammals, marsupials etc alongside colour & design considerations. 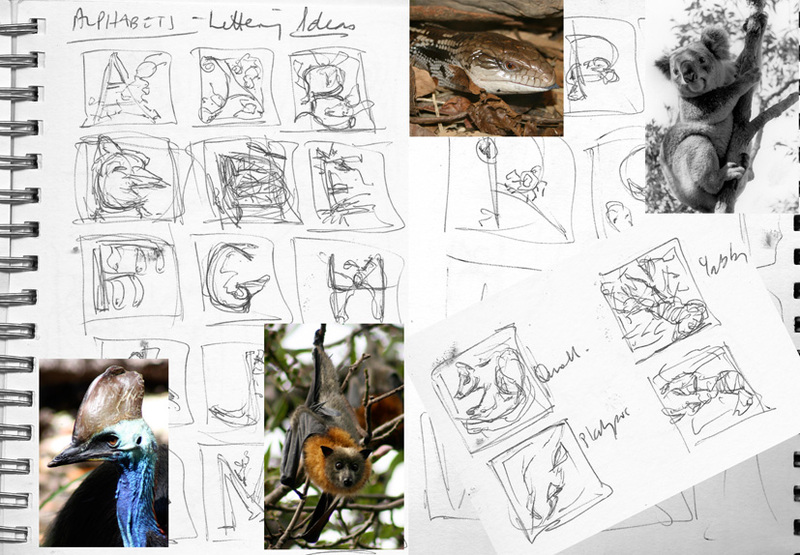 Once I had the basic drawings & designs worked out I again inked in each ‘letter’ & looked at the alphabet as a whole. Again changes in individual designs as well as the overall piece as a whole was worked on & developed. Here are a couple of quick ‘timelines’ showing the evolution of the Hercules Moth & the Echidna. Then to the carving, printing & finally the handcolouring. For the Australian Wildflower Alphabet – I decided to simply represent each wildflower within the 10cm x 10cm format I had chosen rather than use the alphabet lettering shapes I had started with for the wildlife. In between all of this I have been a Carer for my elderly family members & my sons for about the past 10 years in particular, but at the beginning of this year we became ’empty nesters’ which meant I had a lot more time to actually spend getting back to my artwork! Over this time I had also developed real difficulties with my shoulder/neck that was significantly impacting my capacity to not only carve Lino but to work generally. In July 2012 I finally had shoulder surgery & set about the slow & steady recovery. When I was invited by Ingrid Hedgcock to exhibit at the Northern Rivers Community Gallery early this year, it provided the impetus to not only restart my arts practice which had been limping along for the last few years, but to finally complete some of the projects I have had on the very slow burn. This included this long-standing project of the set of Australian Alphabets. Although I had completed all the individual linocuts for these posters some time ago, I had become stuck on how to develop these onto a poster format & to find funding to actually complete the project. A few months ago I approached awesome Artist/Printmaker/Designer Joanna Kambourian of Ms Browns Lounge & Lismore Arts Space to work with the design of the poster. After discussing a couple of different ideas that I was thinking about – you can see a couple of these below, Joanna worked on the final concept design & completed all the pre-press work for production printers. Then to find a trade printer to commercially produce the posters. Joanna recommended CJKing Printers who are based in Perth & on the Gold Coast – not far from where I live. I made the decision to use a heavier weight paper that could still be rolled (& springs back to flat) but which I could also get gloss celloglazed. CJKing have been great to deal with they have produced a rich gloss quality poster that I am just so pleased with. These posters retail for $20 plus $6.95 for postage in a mail tube (postage includes up to 5 posters in one mail tube) and can be ordered from my website by clicking here – or click on the images below. They would make a lovely Christmas present (shameful plug :)). It is generous of you to share your process the way you do. I always learn something, as well as enjoying the beauty of your images. So beautiful Lyn! I love the timeline shots that show the progression from sketch to final art. What a great blog! I WILL have a go at this technique this year..